In 2004 I started playing miniature wargames. I was introduced into the hobby with Necromunda, the Games Workshop forgotten stepchild. Like most all of my gaming choices, I chose my gang based on the models and I had a liking for the Van Saar figures. Having a background in model car building I used Testers Model Master Purple Pearl which I had purchased to make a tricked-out ’59 caddy hearse. I also used the Plaid Apple Barrel paints for the other colors. OK, not the best quality paint for this kind of thing, but I was just starting and did not know any better. 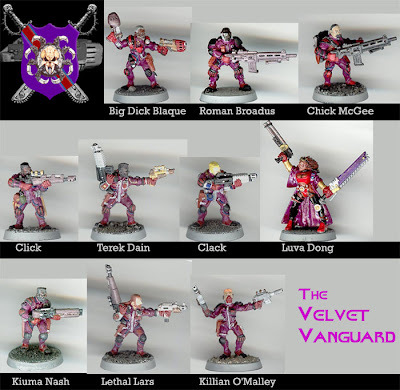 I named the Underhive gang after two Drum and Bugle corps: The Velvet Knights and the Santa Clara Vanguard. Here they are in their purple glory.